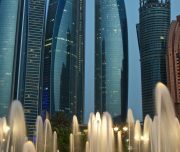 Abu Dhabi is an enchanting culture, hospitality and exciting adventures. There are discovering a host of breathtaking sights and on every journey one makes new great discoveries. Abu Dhabi has, among other things one of the impressive test landmarks in the world has to offer. The Sheikh Zayed Mosque will amaze you by your beauty in stowing. A look inside the mosque you should not miss. Want to do something perhaps more to motor sport so you will please our next program point very. On our tour we stop course at Ferrari Word Abu Dhabi. For large and small motor racing fans an absolute must. The Ferrari World Abu Dhabi is the first Ferrari theme park in the world and has more than 20 attractions and rides and interactive shopping and many culinary experiences. Among other things, there is also the fastest rollercoaster in the world. At a speed of 240 km / h thrill is guaranteed. To return to calm a bit nerve is a further point of the tour the Emirates Palace. A legendary landmark of Abu Dhabi. This luxury hotel combines Arabian splendor with modern The hotel has 114 domes and around 1,002 chandeliers. The largest chandelier weighs 2.5 tons. This stunning beauty you have once even saw. On this tour the guests determines the expiration.